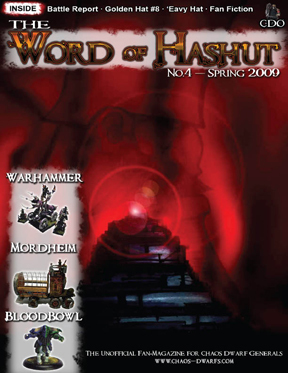 Herein you will find the re-release of all of the Word of Hashut PDFs going back to Issue #1 last year. We went through and spruced up all of the issues and hopefully the effort was worth it. As to the why of this; we are not at liberty to discuss the why at the current time, that is a post for a latter time and probably one from Xander. 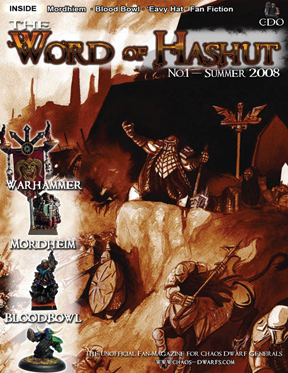 Also some have been wondering if this is due to Games Workshop releasing Chaos Dwarfs... we can only really say this one way: we don't know about Games Workshop's plans anymore then anyone else on the web. 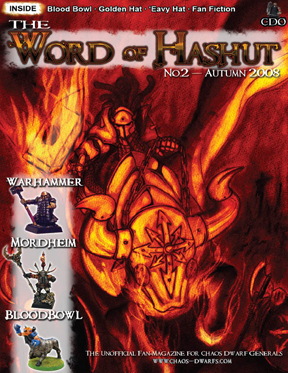 We hope for a release of a new Chaos Dwarf army book just like everyone else, but we are not privy to any inside information. So lets keep plugging along and hopefully we will have our day. Special Thanks to those that pitched in and helped, special thanks to Grupax and Baggronor especially. This post was last modified: 04-19-2009 09:14 PM by Willmark. 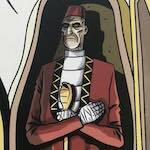 How to torture a zombie... lock him in a room full of lawyers. Think about it. No brains. Good to them back up though! FORGET AoS. Whoever designed it isn't fit to pour [water] out of a boot with instructions written under the heel. 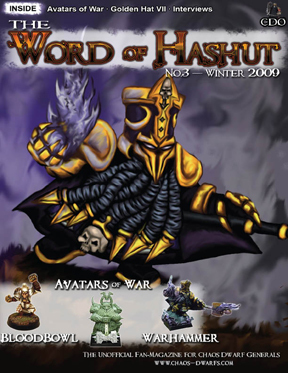 I would hurt a family member if that's what it would take to make a new Chaos Dwarf army book appear in the next year. This post was last modified: 04-20-2009 01:56 AM by squalie. Sacrifice your family to Hashut! I swear if I see that on the news I'll have to beat you with a snotling. I'll invent them just to do it too! Glad to see the Word is back up. When the traitor's hand strikes, it strikes with the strength of a legion. I´m looking forward to Issue No. 5! PS What is the White Dwarf??? It was a respected publication that has long since devolved and fallen from grace. Its last really good issue was #90, I think. yea im back !!!! ggreat work this month !! Well im going to print all of these and reed them back to back I shall return once my eyes hurt and I have drunk four buckets of cola. In need of witty Socialist sig. Who knew reading Word of Hashut was hazardous to your health??? Yeah... Got to love GW and their IP lawyers... I found about 12 things as far as names that they supposedly own the IP on.. but actually they dont. LOL. Such as Grom.. They say they own both Grom and Grom the Paunch.. Really.. Last I checked the Conan Books predate GW.. As well as the Chaos Star... Love to see that hold up in court. Aw, point of fact: Conan's god is Crom with a "C."
sorry... i got it wrong.. but they also say they own both Crom and Crom the Conquerer as well... Pretty much any named character they have down as owning it as both its singular name if it has one and its full.. With a few Exceptions.. Such as Orion. They only have Orion, King of the Woods. This post was last modified: 04-27-2009 09:44 PM by Servius.